“Driver misses Dazie” er nu online på Amazon. Det er en børnebog om at miste, skrevet af Kay Francis, en amerikansk forfatter, der arbejder som terapeut i sin hverdag. Jeg har illustreret bogen, med karakterer bygget på en tidligere udgivet version af figurerne. Det har været spændende at arbejde med Kay, og jeg glæder mig til at illustrere flere af “The ItsIts” historier, som Kay har planlagt en hel stribe af. 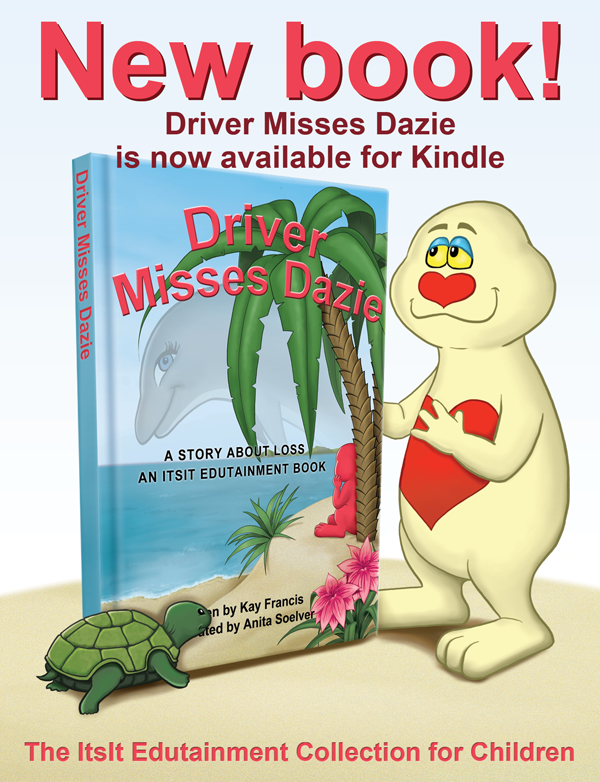 “Driver misses Dazie” is now available on Amazon in Kindle edition 😀 It’s an ItsIt “edutainment” book, that helps children learn in thoughtful and sensitive ways how to deal and cope with the issues of loss and the different feelings brought on by loss. The book is written by Kay Francis, who is a licensed marriage and family therapist. Kay had already published one book with the ItsIt, but her illustrator was no longer doing freelance work, and thus was she looking for a new illustrator to create the drawings for the next books in the series. The characters were already established in the first book, but Kay gave me permission to give them my own touch, as long as they still were in line with the old characters look, of course. I’m happy with the result, and hope Kay will have much succes with her series. You can look inside the book, if you click on the image. It will take you to the product page on Amazon.